Theophilos assembled as a friend of God. 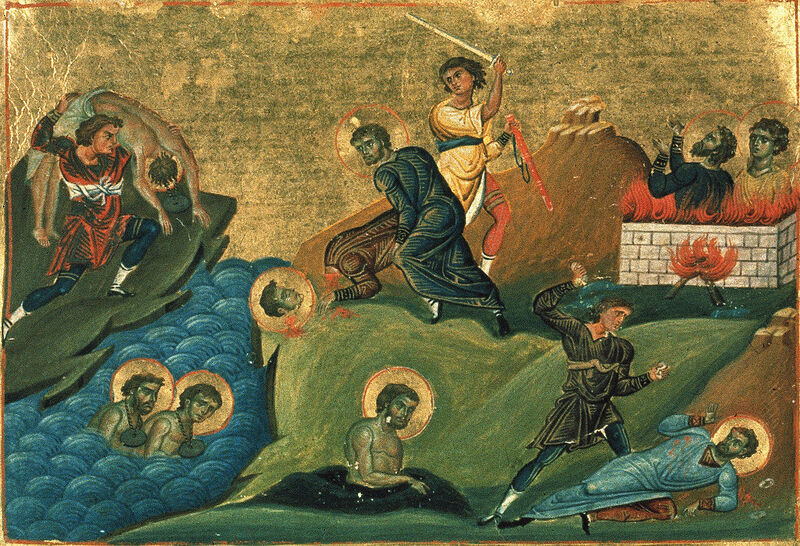 Theophilos was a Deacon who stood before the emperor Maximian with Saints Dorotheos, Mardonios and Mygdonios. While the latter three were in prison, Bishop Anthimos had sent Deacon Theophilos with a message for them. Bishop Anthimos and Deacon Theophilos had been miraculously preserved from being burned alive when the church was set fire killing 20,000. They were spared to help build up and benefit the Church of Nicomedia. Now some soldiers spied on the Deacon when he was at the prison, and he was arrested and placed in the same cell as Dorotheos and Indes. Thus, when they were summoned for their examinations, Theophilos was there with them. The letter sent by the Bishop was presented as evidence. Within the letter, the Bishop encouraged the Martyrs and rebuked the false gods worshiped by the emperor. When the emperor read the letter, he was infuriated, and inquired of Theophilos who had written it. Theophilos responded that it was Bishop Anthimos, who had written the letter as a shepherd of rational sheep. He further said that though he revealed who the writer was, he would by no means reveal where he was. The tyrant thought the response of Theophilos to be over-bold, so he had his men sever his free-speaking and undisciplined tongue. After this, he was subjected to stoning, and by this received a blessed end.